The Department of Music in the The School of Arts and Social Sciences welcomes Nicholas Cook as part of its 2018-19 Research Seminar Series. The seminars are open to all. As this event is likely to be popular we ask on this occasion for planning purposes please register using the Sign Up button. 'One does not simply "sing"', wrote Bruno Nettl, 'but one sings something that has an identity'. But what sort of a something? Musicologists have for some time complained about the traditional, scriptist conception of the musical work - as an artefact constructed out of writing and reproduced in performance, an embodiment of the paradigm of reproduction - but they have been slow to propose alternatives. That is the aim of this paper, which is based on a chapter from a book-in-progress that extends a performative approach from musical performance in the narrow sense to such dimensions of musical culture as sociality, identity, and encounter. In essence what I propose is the reverse of the scriptist model: rather than seeing music as a literary or material construction in which performance appears as the icing on the cake, I put forward a performative model which incorporates literary or material elements within it. To do this I develop the idea of collaborative performance as a relational system, beginning at the micro level of what Colwyn Trevarthen and Stephen Malloch call communicative musicality, and enlisting approaches from Keith Sawyer and Benjamin Brinner to elaborate an improvisation-based model of performance as a real-time interactive network. Next I extend this through a series of case studies that incorporate nonhuman agents such as recordings and scores within the network: both are vehicles of space- and time-shifting, and as such afford the historical (or, seen in another light, synchronic) dimension that defines 'performance' in the (problematic) sense that contrasts it with improvisation. This is what I meant by a performative model that incorporates literary or material elements, and it entails getting away from the traditional idea of musical text conditioned by the paradigm of reproduction. I seek an alternative in the anthropological idea of entextualisation, which offers a broader, more flexible, and as I claim more musical conception of text - a claim I substantiate through reading the historical development of neumes through it. The result, I hope, is a way of thinking about Nettl's something that bypasses traditional binaries such as text vs performance and composition vs improvisation, that is not tied to the contingencies of western 'art' culture, and that recognises music the performing art we all know it is. 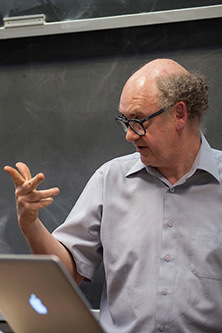 Nicholas Cook is Emeritus Professor of Music at the University of Cambridge, having previously taught in Hong Kong, Sydney, Southampton, and London. His Music: A Very Short Introduction (1998) is published or forthcoming in sixteen languages. Among his more recent books, The Schenker Project: Culture, Race, and Music Theory in Fin-de-siècle Vienna (2007) won the SMT's Wallace Berry Award in 2010, while Beyond the Score: Music as Performance—based on his work as Director of the AHRC Research Centre for the History and Analysis of Recorded Music (CHARM)—appeared in 2013. His latest book, Music as Creative Practice has just been published by Oxford University Press, and he is currently finalising a book provisionally entitled Music, Encounter, and the Relational, for which he was awarded a British Academy Wolfson Research Professorship. A former editor of Journal of the Royal Musical Association, he is a Doctor of Humane Letters of the University of Chicago and was elected Fellow of the British Academy in 2001.